Always good to see there's some players who have stuck around over the years. 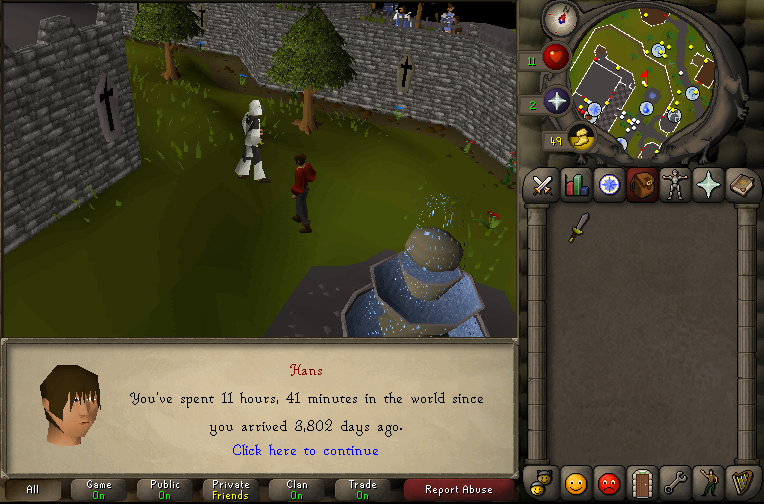 My only account is just over 3700 days old, so 10+ years. 95 days, 6 hours, 43 minutes and counting. Arrived 3,499 days ago. Trying to get that 10 year cape please! Also, i'm only 1894 total and going up at this time. Some of you make me feel like a failure by being way more efficient than me haha. If you need me, put my signal in the sky, like Bruce Wayne. Our accounts were created on the same day then. I'll have to check later in the day to see if it's exact. Went through tutorial island just to see. Edited by niknik, 25 February 2015 - 11:19 AM. My main (hellboysjd2) got perm banned on feb 28th last year, no idea how many days.. Wish they made this update jan last year when i played.. 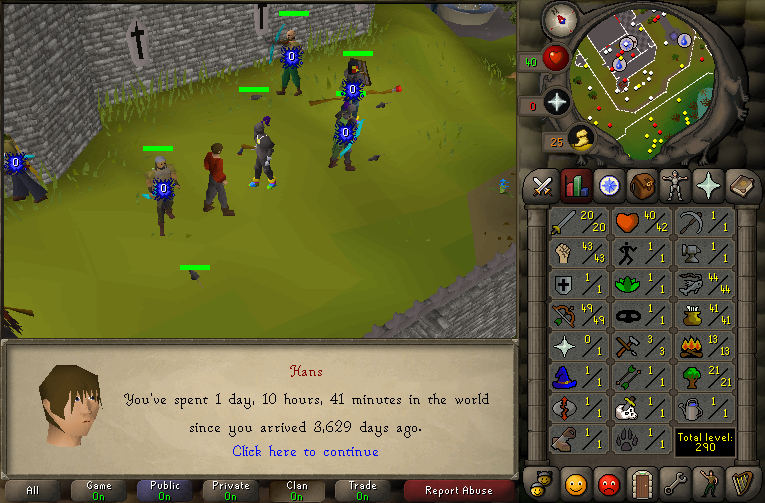 I know it was made during October 2004, had 280 days of gameplay when the achievement diary was still in beta & 410 days total on RS2/Rs3/EOC - i'll admit that many of these months were played cheating, no surprise i was banned eventually.. Only took em 10 years to catch me. Edited by hellboysjd2, 25 February 2015 - 1:23 PM. disabled viewing signatures & avatars. I believe I created my account in mid-late 2005, so it should be getting close to 10 years old. Officially retired for good as of 1/11/2017 - It was a good run. Farewell RuneScape. Edited by Hatrik, 07 March 2015 - 8:53 AM. 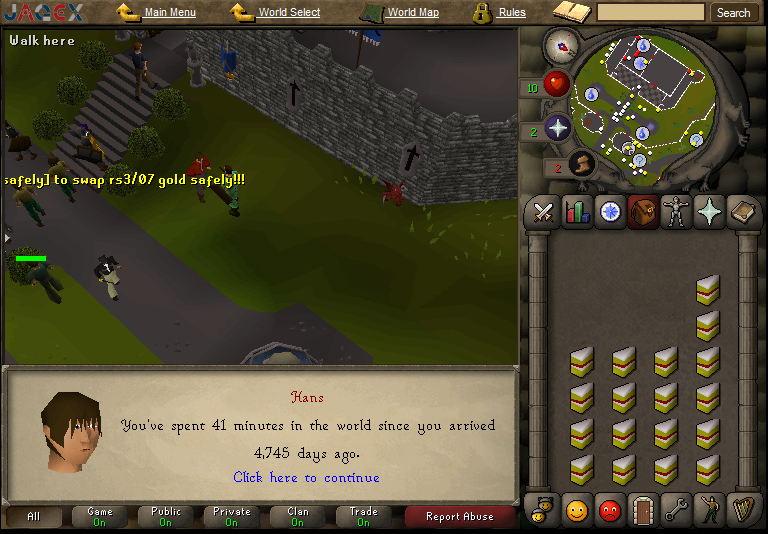 4,388 days on my main... damn XD that's like 12 years. My RS3 account was made around Mid 2004. Made it in September 2004. Wow I have had so many accounts but I still doubt id beat that lol. This was my second account, no idea what happened to my first. Edited by wo0t 1, 24 March 2015 - 3:39 PM.